On October 2, 1985, screen legend Rock Hudson died, due to AIDs-related complications. On October 2, 1985, screen legend Rock Hudson died, due to AIDs-related complications. He was 59 years old. 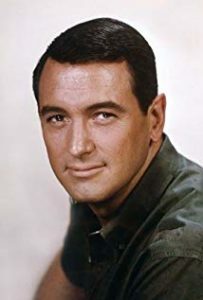 Rock Hudson, born Roy Harold Scherer, Jr., was the preeminent “heart throb” and “leading man” of his era – the 1950’s and 1960’s. His greatest critical success came when he starred in the film Giant (1956) where he was nominated for an Academy Award. But his career, which spanned more than four decades and included almost 70 films, featured a string of hits. He starred in films like All That Heaven Allows (1955) and Magnificent Seven (1954), Tobruk (1967) and Ice Station Zebra (1968). He was also well known for his romantic comedies like Pillow Talk (1959), Lover Come Back (1961) and Send Me No Flowers (1964). Hudson also found success on the small screen, starring in McMillan & Wife, which ran for 6 seasons, and had a recurring role on the ABC soap opera Dynasty in the 1970’s and 1980’s. Rock Hudson was the first major celebrity to die of AIDs.